First Line: "Congratulate me, Red!" Octogenarian Myrtle Clover may be the police chief's mother, and she may have a bit too much time on her hands, but she knows how she prefers to fill it: by solving any crimes that may happen to cross her path in Bradley, North Carolina. Tammy Smith has been running the Beauty Box for several years now, and as the beautician to many of the women in town, she is privy to a lot of secrets. But when Myrtle drops in to have her hair done, she's witness to an inebriated Tammy blabbing all sorts of tidbits about her customers in front of mortified clients-- and it's not the first time she's done it. When Tammy is later found dead at the bottom of her basement stairs with a pair of shears in her back, Myrtle just knows she has the inside track on finding a killer. Trouble is, the killer may also have the inside track on stopping her. Myrtle Clover is just the type of crafty, snoopy little old lady that you have to laugh at... and give thanks that she doesn't belong to you. Even though her son Red has told all of his police officers not to say a word about this murder investigation to his mother, Myrtle still finds out bits and pieces of information that spur her on. This woman is sharp-- and she's not above playing the age card when she thinks it will get her what she wants. There always seems to be someone who falls for the "confused little old lady" or the "worn out little old lady," and once they do, Myrtle swoops in for the kill. Metaphorically speaking, that is. 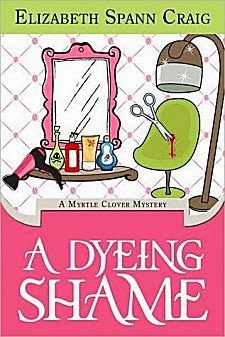 The mystery's a good one, with a long list of suspects, but it's Myrtle who's the star of A Dyeing Shame. If you're in the mood for some fast-paced fun, this is one old lady to spend the afternoon with. Just make sure your house can withstand a snoop-through. Source: Purchased as an eBook from Amazon. Like the story, the title and the cover! thanks for the review. Cathy - Oh, I like the Myrtle Clvoer series. I'm so glad you enjoyed this one too. Isn't she a great character!??! And there's a nice thread of wit through the novels too. I think Pretty is as Pretty Dies is a nice read too, and so are the other two in the series. Myrtle is a great character, and I have to admit that a bit of my liking is due to the fact that my great-grandmother's name was Myrtle-- and she was quite the character, too!